The guests go into the tea garden with the main guest leading, and take a short break in the inner waiting arbour. During this time the host sweeps the tea room, and opens the skylight a little wider. He also removes the scroll from the alcove, hangs a flower container on the front wall of the alcove and arranges a flower in this. He checks the condition of the charcoal fire (hiai) and whether the kettle is boiling, and arranges the mizusashi (fresh water container) and the chaiire (thick tea container), so that he is ready for thick tea. When the tea room is ready he strikes the dora (gong) or the kansho (clapperless bell) calling the guests back to the tea room. Finally the guests leave the inner waiting arbour to enter the tea room for the second time. When the guests have all returned, the host's assistant (hanto) takes down the sudare (rush blinds) that had been hanging outside the shoji (sliding paper screen doors), so that the tea room is completely changed, becoming much brighter. Here thick tea is prepared by the host. The main object of the tea event is this bowl of thick tea. The host changes into a kuromontsuki (formal black kimono with family crest) to do tea procedure. 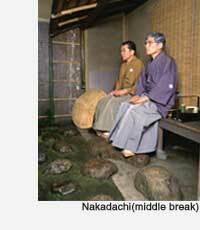 No smoking is allowed in the tea room and zabuton cushions are not used. In an atmosphere of high tension the guests share a single bowl of thick tea. The host has taken special care to prepare thick tea that has a good flavour and aroma, so the main guest asks him about the name, the maker and the place it was made and the same for the sweets, and thanks him for the care he has taken. When thick tea procedure is finished, the guests examine the tea container (chaire), tea scoop (chashaku) and shifuku (pouch). This is called 'sanki no haiken' (viewing the three utensils). Then charcoal is arranged in the hearth again (gozumi), thin tea is offered to the guests and the inscriptions on the utensil boxes are examined. When thin tea has been drunk the chaji is finished. The last guest takes the tobako-bon (smoking tray) and the cushions to the mizuya and then the guests leave the tea room. In front of the tea room they are seen off by the host from the guest entrance and they bow to him, then they walk through the tea garden back to the yoritsuki (changing room) and then leave the host's residence. The next day one of the guests goes to see the host and conveys the thanks of all of the guests. This is called gorei ('thanks given after the tea event').